Posted by Dave Emory ⋅ November 21, 2018Post a comment Email This Post Print This Post Tweet This! COMMENT: We have spoken for years about The Crusade For Freedom, a covert operation with both foreign and domestic venues. Abroad, the CFF was a vehicle for financing the use of Eastern European Third Reich alumni as “fascist freedom fighters” in paramilitary operations in the Soviet Union and Eastern Europe. Domestically, the CFF spawned a Nazi branch of the Republican Party, with roots in the Third Reich and the Reinhard Gehlen spy organization. The CFF became a major element of the U.S. Cold War establishment. Many of its participants and associates were prominent not only on the far right but in the National Security Establishment as well. Some of the most important Republicans on the national stage not only were essential parts of the CFF/Nazi GOP nexus but also figure into the investigation into the JFK assassination. CFF godfather Allen Dulles was the principal member of the Warren Commission and appears to have been an architect of the assassination itself. Richard Nixon was in Dallas on 11/22/1963, flew out about an hour and a half before the fatal shots were fired and then lied about it to the FBI. Ronald Reagan was on the Rockefeller Commission that found (incorrectly) that the CIA was not involved in the assassination. He also refused to honor Jim Garrison’s request to extradite Edgar Eugene Bradley from California. George H.W. Bush was in Dallas on 11/22/1963 and says he can’t remember where he was when Kennedy was killed. 1a. The Secret War Against the Jews by John Loftus and Mark Aarons; Copyright 1994 by Mark Aarons; St. Martin’s Press; [HC] ISBN 0-312-11057-X; pp. 122-123.
. . . . In 1952, Nixon had formed an Ethnic Division within the Republican National Committee. Displaced fascists, hoping to be returned to power by an Eisenhower-Nixon ‘liberation’ policy signed on with the committee. In 1953, when Republicans were in office, the immigration laws were changed to admit Nazis, even members of the SS. They flooded into the country. Nixon himself oversaw the new immigration program. As Vice President, he even received Eastern European Fascists in the White House. . . .
1b. The Secret War Against the Jews by John Loftus and Mark Aarons; Copyright 1994 by Mark Aarons; St. Martin’s Press; [HC] ISBN 0-312-11057-X; p. 605. 1c. The Secret War Against the Jews by John Loftus and Mark Aarons; Copyright 1994 by Mark Aarons; St. Martin’s Press; [HC] ISBN 0-312-11057-X; pp. 369-370. 2. 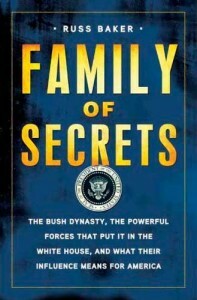 Family of Secrets by Russ Baker; Bloomsbury Press [SC]; Copyright 2009 by Russ Baker; ISBN 978-1-60819-006-5; pp. 77-78.
. . . . In 1951, [George H.W. Bush benefactor Neil] Mallon brought together many of Dallas’s most powerful citizens, from oilmen and titans of the burgeoning military-contracting industry to German scientists who had fled the wreckage of Hitler’s Germany to help fashion weapons against the Communist threat. George de Mohrenschildt moved to Dallas in 1952, established himself as a consulting geologist, and was quickly accepted into the city’s ruling elite. He joined the powerful Dallas Petroleum Club and became a regular at Council on World Affairs meetings. Many of the figures involved in those two entities also showed up on the boards of other influential local groups. One was the Texas chapter of the Crusade for Freedom, a private conduit for laundered money to be sent to “freedom fighters.” . . . .
. . . . Members of the Texas Crusade for Freedom would become a who’s who of Texans connected to the events surrounding the assassination of John F. Kennedy. In addition to Neil Mallon, members included [Paul] Raigorodsky, Lewis W. MacNaughton, Everette De Golyer, and Dallas mayor Earle Cabell, brother of Charles Cabell, who was Allen Dulles’s deputy CIA director [fired by JFK for his conduct in the Bay of Pigs operation along with Dulles himself]. Another member was D. Harold Byrd, who owned the building in downtown Dallas that would become known as the Texas School Book Depository. Another member was E.M. “Ted” Dealey, publisher of The Dallas Morning News, who was a harsh critic of Kennedy. . . .
Trang web cá cược trực tuyếnClick here to cancel reply.